...then you're in for a long essay. The Royal Botanical Gardens in Madrid are starting to look beautiful. Happy birthday celebration #1 for me. Flamenco at Casa Patas in Madrid, birthday celebration #2. So beautiful and intense. Also seen at school, my little student who brings bugs with him. The day before he found a wasp at recess and put it in a bag, which he proceeded to carry around during gym class. This little beetle was let loose during English class. Pretty planters in the window for spring. Sometimes, I am taken aback by how beautiful our city is. And I'm trying not to take for granted that I get to see this view every single day on my way to work. 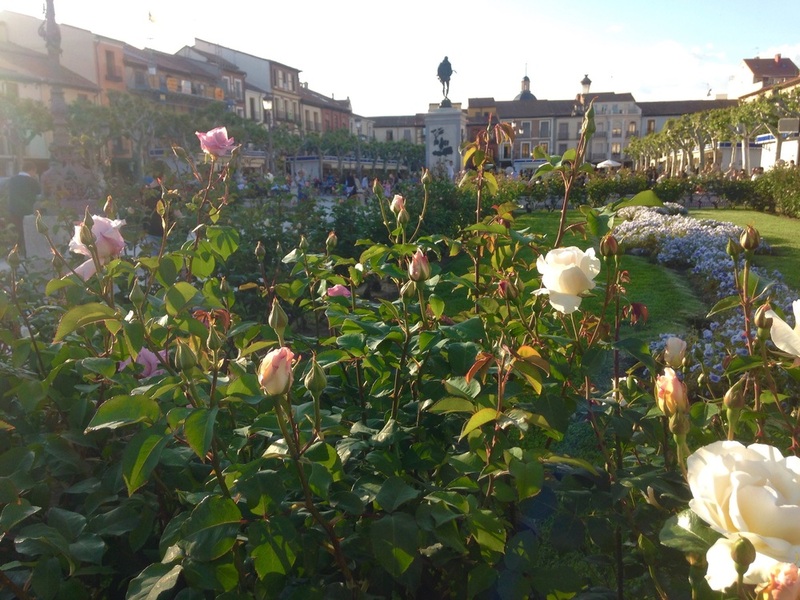 The roses are in bloom in Plaza Cervantes. Ditto. And everything is now so green! The gazebo and buildings near Cervantes against the blue sky. I love that everyone is outside now, enjoying warm evenings and the longer hours of sunlight on the grass and at the cafés. The facade of the university in the evening.